It's official: The notebook computer can now see as well as take your picture. Meet the Intel RealSense 3D camera. Middle of last year, Intel had announced that its version of the Kinect camera would be available in mid- to late-2014. On Monday at the Consumer Electronics Show, Intel made it official: Laptops with the integrated camera will be available later this year from many major OEMs, including Acer, Asus, Dell, Fujitsu, HP, Lenovo, and NEC. The types of products to include the integrated camera will include two-in-ones, tablets, all-in-ones, and traditional PCs. Simply put, Intel is trying to give the PC a more human-like sense of perception, adding sight and hearing to its existing "senses" of touch. It's also Intel's way of robbing some of the value of the smartphone and putting it back into the PC. Mooly Eden, senior vice president of Intel's Perceptual Computing Group, said that the PC has evolved into something we carry not around, but on our person. In the future, he said, we'll open cars with our finger and access information more directly with our brain. Those models, Eden says, guide Intel's thinking. Last summer, Eden offered PCWorld a sneak peek of what Intel was trying to do with perceptual computing, complete with an early, discrete version of the camera manufactured by Creative Technologies. On Monday, Intel took the next step. Referencing the interface and experience between man and machine in movies like Star Trek, Eden said "for the first time we are closing the gap [between man and machine] enough to deliver these experiences." Intel said that man-machine interfaces must be natural, intuitive, and immersive. To do this, Eden proposed using 2D cameras as a model: first discrete, then mounted, then embedded. 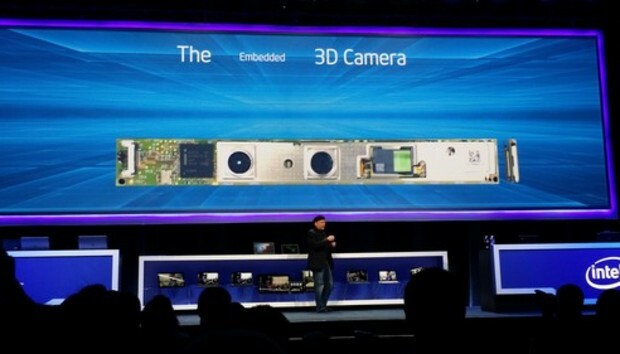 Intel has already developed and demonstrated a 3D embedded camera. Eden said that Intel will work with its partners, including the hardware makers listed above, to embed that camera in their laptops. Eden showed off systems from Asus, Dell, and Lenovo, although just conventional laptops. Intel will market the camera, as well as a number of future products, using the RealSense brand, Eden said. He didn't say how many products Intel would produce, or whether they would be simply improvements on the 3D camera or else a diverse product portfolio. However, the markets will span from traditional consumer, to gaming, to capturing and sharing. Eden also announced several partnerships, one of them with 3D printing manufacturer 3DSystems, which will use the RealSense camera to capture real-world objects in 3D then send them to a printer for mass production. Microsoft and Intel forged a partnership around Lync and Skype, using the RealSense technology to strip out the background in a videoconference and replace it. Similarly, a partnership with Microsoft used "air gestures" to pinch, zoom, and pan the screen--without touching. Within Google Earth, face tracking built into the camera allows a user to simply pan around by looking left and right. Intel also announced an Intel-specific version of the Nuance Dragon Assistant digital assistant optimized both for the Intel Core and the Atom processors (read here). The Dragon Assistant connects with various online services, including Google and YouTube, to search, play back video, and access various applications. "For the first time, you will find yourself speaking more and more into the computer," Eden said. Eden and some of his partners also showed off a few Intel-branded games that included pinball and a hover jet simulator. The company also discussed a partnership with Scholastic to bring to life an augmented reality playset, with both real-world and virtual objects, such as virtual sheep climbing a real toy bridge. Dreamworks, Autodesk, and Tencent will also participate. While the long list of demonstrations grew a bit dull by the time they were completed, they showed off the range of industry support for Intel's initiative. Intel clearly believes that the RealSense brand and camera could end up being a platform, enabling new experiences that weren't possible previously. Does the PC need the kind of alternative interfaces Intel is pushing? Actually, yes. Will consumers adopt them? If they're integrated, undoubtedly. Just as applications like Skype grew on the foundation of webcams, so could a number of new applications grow on the shoulders of the RealSense brand. Time will tell. « Next ARM server chip maker: Qualcomm?